John and Nikki enjoy serving with Armed Forces Baptist Missions. They are committed to the work of planting and preserving local churches outside of US Military bases overseas. Having served overseas as a Christian, John realized the necessity of ensuring that our US troops and their families have a place to worship and serve the Lord while stationed abroad. Nikki will assist in leading ladies Bible studies, playing piano for the congregational worship services, as well as taking care of their four children, Josiah, Seth, Shiloh, and Ty. The Glenn family will be going to the troops and families of the 173rd Airborne. This base is located in the northeast region of Italy. They are excited to get to this base and share the gospel of Jesus Christ with those who have no hope and to equip believers to serve with greater fervor and passion for the King of Kings and Lord of Lords. John was raised in an unsaved home. Several months after joining the Unites States Marines, John’s squad leader shared the gospel with him and he later received Christ as his Savior. He was immediately invited to Koolau Baptist Church near the Marine Base. He was baptized and joined this church where he was discipled and grew in Christ as he served in various outreaches of the ministry. While deployed to Okinawa, Japan, John was invited to a local church outside the base. Here he met a military missionary who ministered to the troops and their families stationed overseas. It was while attending this church that he surrendered his life for God’s service. After attending Bible College, John was asked to come and help plant a church on the Big Island of Hawaii. Later, he was asked to join the staff at Koolau Baptist Church where he served for 5 years as a Single’s Pastor and operated the serviceman’s center. 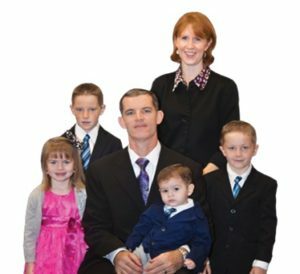 It was while serving at Koolau Baptist Church during the Missions Conference, that John and his family surrendered to minister to US troops and their families overseas. Nikki had the privilege of growing up in a Pastor’s home where she accepted Christ at a young age. While attending Bible College she was able to go on a missions trip to China. After graduation from Bible College, Nikki served as a teacher at Koolau Baptist Academy. John and Nikki were married in 2002. They both share a desire to reach our US troops and their families for Christ as well as see them live lives dedicated to His service. • 14 years in part-time and full-time ministry. • Born in Grand Junction, Colorado. • Loves reading, interior decorating and being a wife and mother. God calls AFBM missionaries to serve in unique ways around the globe. Maybe He is calling you to have a special role in John and Nikki’s ministry to Italy. Please pray about partnering with them through prayer and/or financial support. Contact the Glenns for more information and to sign up for prayer letters.